What does this sign mean? What does this sign mean? A. Vehicles must not stop at the kerb, unless picking up goods. B. Vehicles must not stop at the kerb, except if picking up a passenger. C. Vehicles are not allowed to stop at the kerb except in a medical emergency. Correct. You must not stop unless it is a medical emergency. This guide explains safe parking and what you are and aren't allowed to do when parking in NSW. When a vehicle is safely parked it is visible and not obstructing other road users. At night time, if you are only parking for a short time you can leave your park lights or hazard lights on to make the vehicle more visible. If you have parked facing uphill, put your handbrake or park brake on, angle the wheels towards the kerb, put a manual car in first gear or an automatic car in P (park). If you have parked facing downhill, put your handbrake or park brake on, angle the wheels towards the kerb, put a manual car in reverse or an automatic car in P (park). Both of these techniques give three levels of failure. Handbrakes can fail, so if it does, the next defence is P (park) in an automatic (it won't roll if in P), or having the car in-gear in a manual, in which case it would need to be a steep hill for the car to roll forwards. If that fails, angling the wheels towards the kerb will mean that the car will roll gently into the kerb and come to rest. 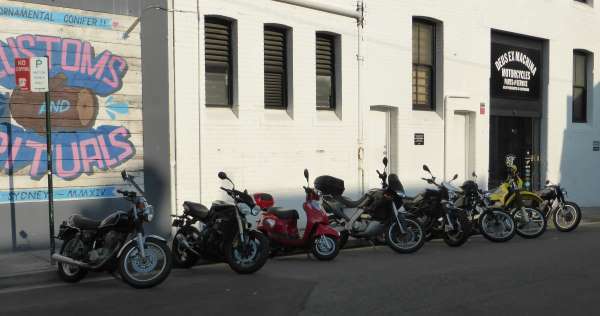 If parking a motorbike, try to park on level ground; if this isn't possible, angle your bike so that it won't tip over. It's important for motorbikes to park on firm ground so that the stand doesn't sink into the ground, which could cause the bike to tip over. When parking for unloading, choose level ground otherwise the load can shift and possibly fall on you when you open the trailer or boot. When you park parallel to the kerb you must leave at least one metre front and back for other vehicles to be able to exit their park safely. Where there is kerbside parallel parking you are not allowed to double-park alongside a parked vehicle as you will be obstructing the roadway. If there are no lines marked on the road (and assuming you are allowed to park there), then parallel parking applies, not angle parking. Angle parking is usually at around 45 degrees to the kerb. Some angle parking is nose in, and others, as in the image below on the left, is nose out. This road also has parallel parking on the other side. When you leave your vehicle, check in your mirrors and over your shoulder before you open your door so that you don't hit a cyclist or other motorist. Some countries teach drivers to open their door with their left hand so that they have to turn their body, and this means they're more likely to see objects in their blind spot. Hide any visible valuables or take them with you. Do not leave pets or children in the vehicle. Close the windows, lock your vehicle and set the alarm. You must take the key with you if you are more than three metres from your vehicle. Double parked (that is in the road alongside a car that is parked). Across a driveway or footpath - this prevents other drivers from accessing the driveway, or forces pedestrians onto the road. On a median strip or traffic island - median strips are to allow people to turn safely, and traffic islands are to help separate traffic at a junction. Parking on a traffic island would reduce drivers' visibility. On motorways or freeways - motorways are high-speed roads and should be as free of obstacles as possible. In a clearway - clearways are designed to keep traffic moving by opening up a lane for traffic when it's needed. On footpaths and nature strips - parking on a nature strip damages the nature strip. 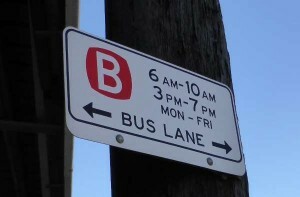 Between BUS STOP, BUS ZONE, TAXI STAND or TAXI ZONE signs - these zones are for other vehicles, as specified. In a safety zone or within 10 metres before or after a safety zone. Within an intersection - parking within an intersection reduces visibility and room for manouevring. 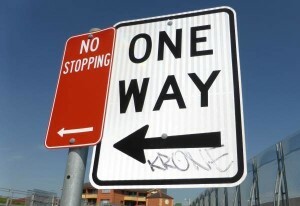 In a slip lane - a left-turn that bypasses a crossroads. Within 20 metres of an intersecting road at an intersection with traffic lights unless a sign allows you to park there. Within one metre of another vehicle parked in front or behind (does not apply when angle parking) - this is so that the other vehicles can exit the parking space easily. Within 10 metres of an intersecting road at an intersection without traffic lights unless a sign allows you to park there - this is to ensure that drivers have good visibility up and down the road as they emerge from the junction, and also so that long and wide vehicles have more room to make the turn. Within three metres of any double centre lines - vehicles aren't allowed to overtake and if your vehicle is creating an obstacle on the left it might force users to have to cross the centre line. Within three metres of an Australia Post letter box unless dropping off or picking up passengers or mail. Within 20 metres before and 10 metres after a bus stop - this gives enough room for the bus to enter and exit safely, and also improves visibility for pedestrians as they leave the bus stop. On or within 20 metres before and 10 metres after a children’s crossing or pedestrian crossing. Within 10 metres before and three metres after a marked foot crossing with traffic signals. Within one metre of a fire hydrant, fire hydrant indicator or fire plug indicator. On a railway level crossing. Within 20 metres before and after a railway level crossing. When you are parking on a hill or a curve outside a built up area, make sure that someone coming over the hill or around the bend can see your car from at least 100 metres away. The parking below is motorbike-only parking and you can see the sign on the left-hand side stating this. 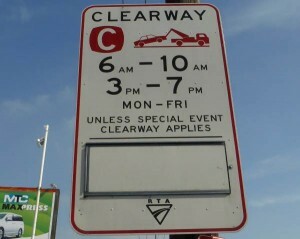 Clearway (in this case between 6am to 10am and 3pm to 7pm Monday to Friday). 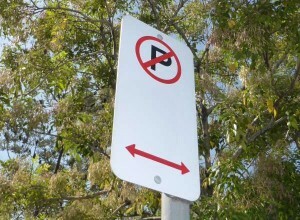 No parking signs - you can stop in a no parking area, but only for up to two minutes (five minutes if you are an MPS permit holder) and you must remain within three metres of your vehicle. You are not allowed to park in taxi zones or taxi stands which will be indicated with 'Taxi Zone or Taxi Stand signs unless you are an MPS permit holder and a sign is within the zone. Some taxi zones will have times shown on the sign. You can stop your vehicle in the zones outside of these times. If you choose to park on private land then make sure you know how much it will cost and what the terms and conditions are. Some private car parks close early and you will be unable to retrieve your vehicle without paying a hefty fee.